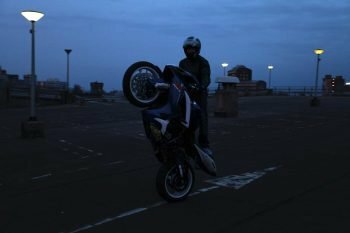 For a while nothing happens until a wheeling motorcycle moves into the sight of the operating security camera’s detected at each corner of the site. 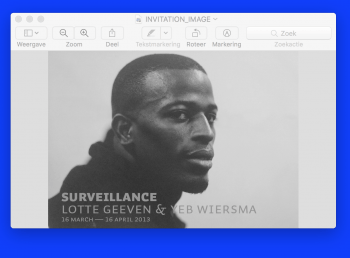 Surveillance — a ‘life & site’ specific project in collaboration with Lotte Geeven hosted by West, The Hague. For the project Surveillance1, Lotte Geeven & Yeb Wiersma collaborated to claim2 the Stationsbuurt in The Hague – as their work and research area. In the course of a month, this area of about one square kilometre became a dynamic space, in which the mechanism of observing is scrutinized in a rough manner with various interventions and using a script that is composed of seven life & site-specific acts. The space of action was marked physically by a square of a gold-leaf line, at once marking the site of research whilst also invigorating a sense of unstable preciousness. 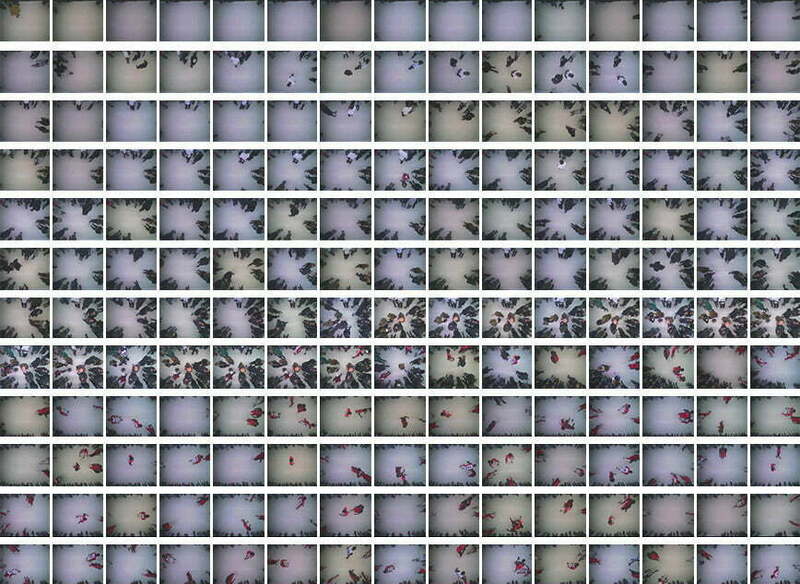 In Surveillance, Geeven & Wiersma investigated the sovereignty of the public space. In doing so, the artists focused attention on the habits and characteristics of the city. The script – the manual of this research – consisted of directed acts that challenge the controlled establishment and made an appeal to the concept of autonomy with a brutal approach to spontaneity. ‘Doublethink’ by George Orwell (1984) -meaning the power of holding two contradictory beliefs in one’s mind simultaneously, and accepting both of them – was a central concept in Surveillance. It represents a mental and physical domain in continuous motion; staggering stroboscopically between authority and autonomy, between control and wildness. The borderline between acts and reality was desultory for the passers-by. 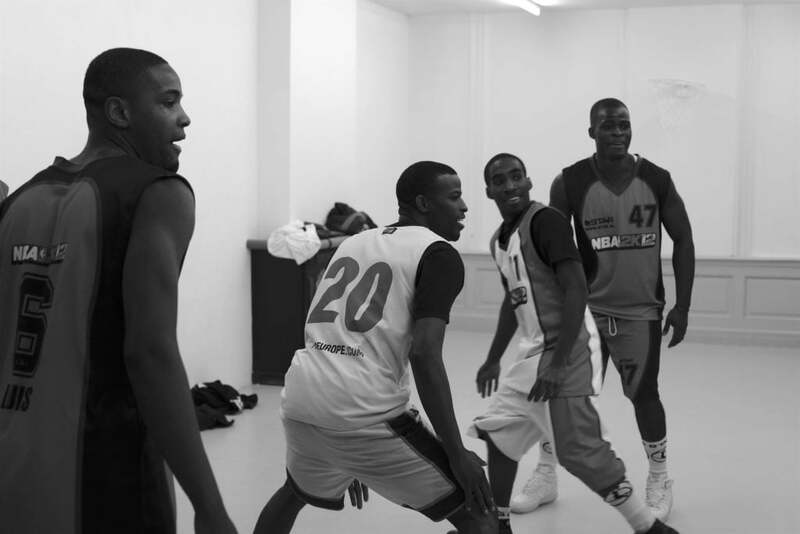 A surveillance camera was installed on the ceiling of the white cube recording the the basketball players, who in a playful way pushed the art audience aside, taking over the space by surprise. The live stream of this recording was screened in the adjacent gallery space. 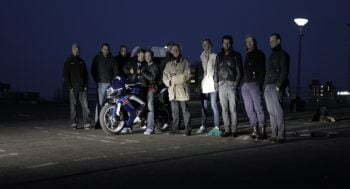 The artists approached a professional motor stunt man to show up – unannounced – at dusk on the rooftop of a parking lot demonstrating his wheeling choreography and double burn outs. Surprisingly, in spite of the operating surveillance camera’s, this roaring act was undetected. 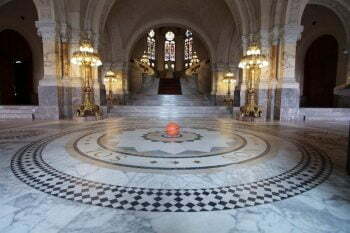 For Act V: ‘The Porcelain Room’ Geeven and Wiersma left a basketball at the entrance of the International Court of Justice (Location dealing with International border conflicts) in The Hague. 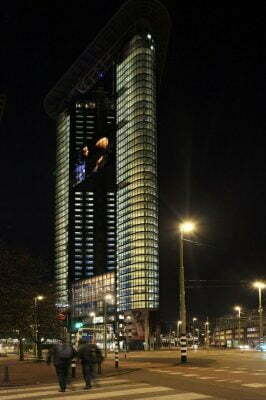 On the highest skycraper in the research area a video of a street basketball player was projected. His eyes gazing at the hypnotizing, spinning ball. 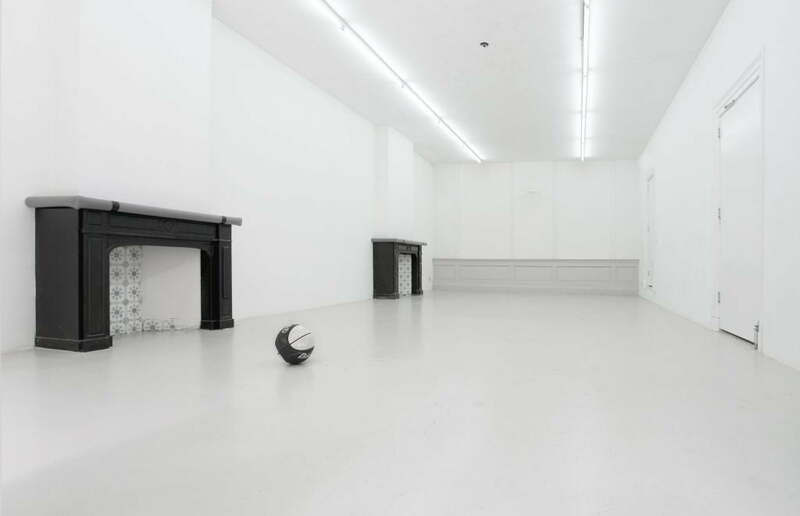 A surveillance camera was placed into the ceiling of the gallery space, where Act No. 1 was about to start. Act Nr. 1: Isaac’s Principles. 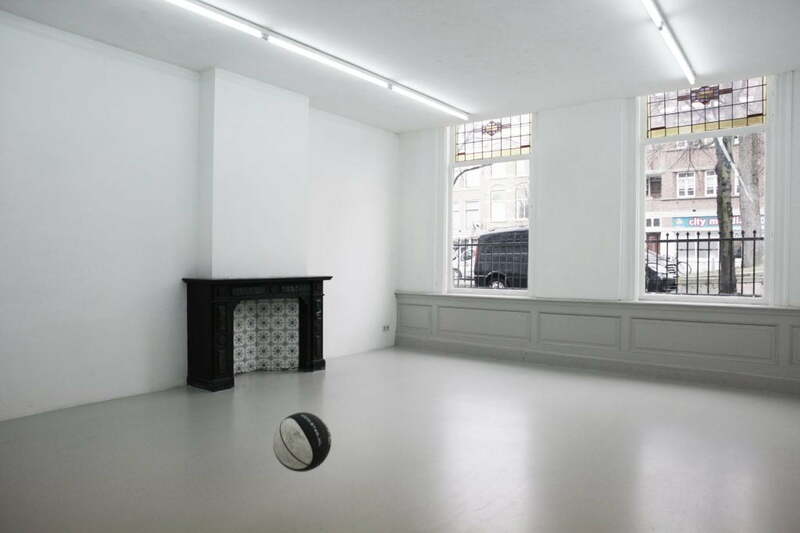 Geeven and Wiersma turned the white cube gallery space into a performative stage by inviting street basketballers from the area to play a game of basketball as the opening act. A physical gesture from the artists to underline the start of their project; disrupting the expected, unsettling the behavior and borders of the private and the public. Isaac’s principles refers to Newton’s theory on the power of objects in motion. 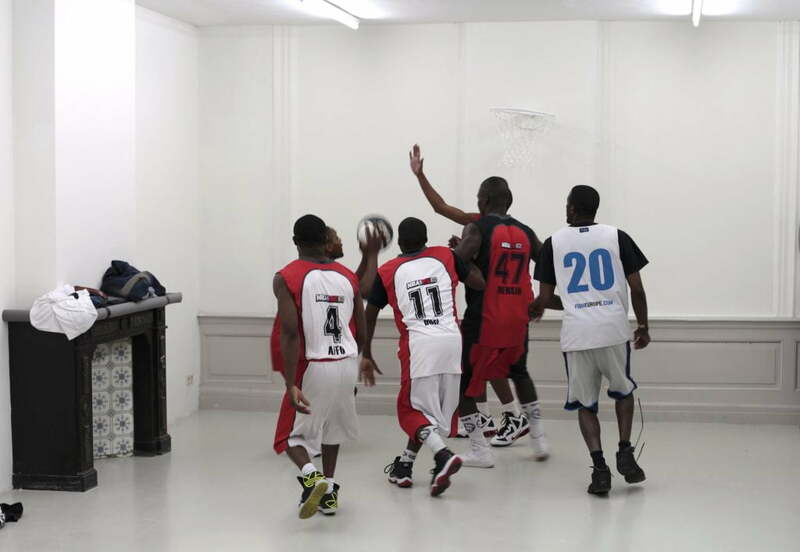 The live stream of the surveillance camera was simulteanously projected in the adjacent gallery space, showing the movement intervention of the players towards the audience. After the openings act Geeven and Wiersma turned the gallery into a public headquarters to organize their six acts to come from.